Our delicious steaks are sourced from one supplier in Ireland. They are guaranteed tender and full of flavour thanks to the unique hanging process to increase the natural breakdown of muscle fibres in each carcass prior to de-boning. Harmony Farm operates the highest animal welfare standards and sources its grass fed beef from carefully selected farms who share their values. Our Pork is sourced from a third generation family farm in Inverness shire. The sows are a mixture of Large White, Landrace and Duroc and are bred for the flavour and succulence of the meat. 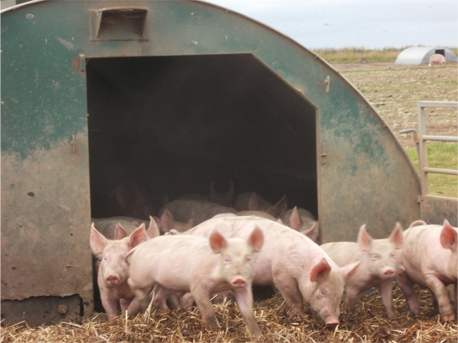 All pigs farrow and live outdoors with access to straw filled huts for shelter. They are fed on a diet of home-grown barley. Our pigs have a high quality of life and are able to act naturally by building nests, rooting, wallowing and foraging. At the end of their life, they have minimal distance to travel. Our Aberdeen Angus beef comes to you from specialist family farms in the Highlands of Scotland. You will find no better roasting joints than our dry aged ribs or sirloin. Just right for that special occasion – so plan ahead! We require four weeks’ notice to ensure your beef is aged to perfection.